What’s the problem with plant-based packaging? As the tide of public opinion turns against single-use plastic, with regulatory changes bound to follow in its wake, we have seen a rapid rise in the popularity of alternative forms of packaging. Businesses across numerous sectors are making the change, backed by politicians, media and consumers. However, this is more than a simple switch. The straightforward act of swapping a plastic cup for a greener option is a complex systemic adjustment with far-reaching impact. As NRC and our customers make these changes, there is one common question being asked regarding this new waste material: which bin should it go in? This working paper sets out NRC’s position on this emerging issue and hopes to clarify its impact. As businesses and consumers have begun to seek out alternatives to single use plastic packaging, manufacturers have emerged to meet this need with plant-based bioplastics. Durable bioplastics have been developed as an alternative to traditional PET bottles, such as fizzy drink packaging. These are manufactured from 30% plant-based ethanol. Durable bioplastics don’t decompose but they can be recycled with regular PET containers. Biodegradable bioplastics are unsuitable for recycling and are, instead, designed to break down completely. This is unlike the vast majority of existing petroleum-based plastics which will break down into smaller and smaller pieces – microplastics – but will never decompose or be absorbed by the environment. The unique nature of biodegradable bioplastics is attracting great attention. One of the most prominent brands of biodegradable bioplastics is Vegware. The specialist manufacturer produces plant-based foodservice packaging such as beverage cups, sandwich boxes and takeout containers. These products are made from renewable, lower carbon or recycled materials, offering an attractive alternative to plastics. In most cases, biodegradable bioplastics are designed to break down along with food waste under high-temperature industrial composting conditions. And herein lies our challenge. 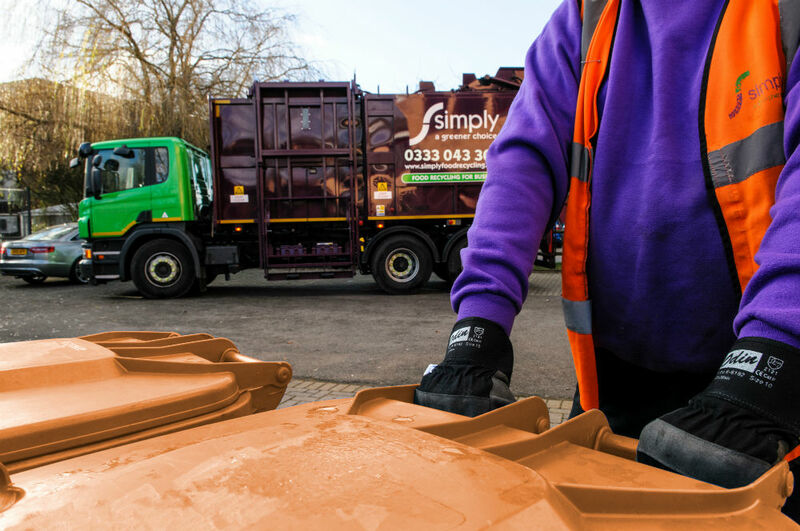 For some years, the UK’s waste and recycling sector has been steered by government subsidies and guidance towards favouring anaerobic digestion (AD) as the preferred method of food waste treatment. Our collection, bulking and treatment infrastructure is orientated accordingly. So, what is the difference between composting and anaerobic digestion? Composting is an aerobic process, reliant on the presence of oxygen. Under layers of waste, organisms naturally oxidise organic matter: nitrogen chemicals turn to nitrate, sulphur to sulphate, and phosphorus to phosphate. The composting process produces a nutrient-rich fertiliser. The slight downside is that aerobic processes produce CO2 as a waste product. Nevertheless, composting is a highly desirable clean source recycling alternative to landfill. AD, on the other hand, is reliant on the absence of oxygen. Materials are sealed off and the bacteria live off the organic matter itself. A slower method than composting, AD produces rich fertiliser and also methane, which is a key component of biogas used to generate clean electricity. The good news is that AD offers a closed loop solution for food waste. The bad news is that bioplastics cannot be treated by AD. In fact, bioplastics entering a food waste stream destined for AD will be mechanically removed before treatment and disposed of as general waste – often at landfill. As the vast majority of the UK’s commercial food waste is processed by AD, this significantly restricts opportunities to dispose of bioplastics as intended. With only circa 170 industrial composting facilities in the UK, we are ill-equipped to adequately compost meaningful volumes of biodegradable plastic. In fact, many operational industrial composting facilities won’t accept bioplastics and other biodegradable plastics as they are seen as contamination risks. It is a sad truth that the rapid movement away from single-use plastics does not align with the current operational reality of the UK waste and recycling industry. As a result, we could even argue that plant-based packaging is less environmentally friendly than using durable bioplastics that can be recycled, or properly segregated traditional plastic that can be recycled or used to produce fuel to generate electricity. Any change to our waste streams, however well meaning, has a wide impact. New products aiming to reduce plastic pollution and boost sustainability need to be considered in the context of the packaging lifecycle, from sourcing to end-of-life, if we hope to achieve a circular packaging economy. Adjusting our national infrastructure takes time, entails an elongated planning process, and requires regulatory standards to be set. Change demands a collaborative and integrated industry approach to ensure that we are able to meet the demands of the market sustainably, and to the right standards. So, meanwhile, we must work with what is available to us. Most organisations producing packaging waste typically have a general waste container and a mixed recycling container. Those in sectors such as hospitality also have food waste and glass containers. So which bin do plant-based bioplastics go in? Only when food waste is collected for industrial composting, can these bioplastics be placed into the food container. Where sufficient volume exists, and a customer process and desire to segregate waste streams further exist, local providers, such as NRC Members, may be able to explore the development of composting options at a local level. This paper presents a short answer to a simple question but we hope it demonstrates the complexity of waste logistics and treatment. Organisations considering a change to plant-based packaging should engage with their local waste and recycling management company as part of this process. A total cost analysis should be carried out and compared with the organisation’s value statement regarding single-use plastics. Under current circumstances, plant-based packaging typically costs more to procure and more to dispose of. In the long-term, the better solution may be for the UK to focus on durable bioplastics that are made from plant materials, but can still be recycled. This way, valuable energy and material inputs can be kept in the production cycle for longer. Given our established infrastructure, it may be more time- and cost-effective to create a plant-based plastic that fits the UK’s existing capability, rather than developing an entirely new biodegradable plastic composting infrastructure from scratch. Whatever the circumstances, it is clear that meeting this challenge requires innovation and entrepreneurial vision, and NRC members are committed to finding workable solutions for our customers.